Has anyone heard much about these new BOSE truck seats that I've seen a few of the YouTube truckers talking about? Or better yet actually used one? Just wondering since BOSE has always been a very high quality product so wondering how they stack up to the rest of the field. Also anyone has any opinions on other good quality seat brands they like as well as the brands they hate? So would I be I sane to leave this job because I'll never find a trucking company that would pay as much in the long run or because of the pension? 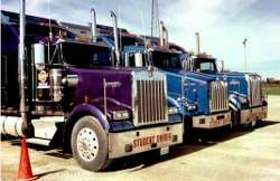 I have been looking into upgrading my CDL from a class B to a class A for a while now. I have been driving a bus for King County Metro which is a transit agency here in the Seattle, WA area. It's a good job, pay starts at 22.41 an hour and tops off around 32 to 34 an hour within 10 years. I have been doing my research and have been wanting to drive a truck for a while now. There are a lot of old veteran truck drivers here that now drive a bus and everyone tells me I'd be an idiot to give up this job and drive a truck. They all drove in the 70's, 80's, and 90's and they all tell me that the pay will never be what I could get here driving a bus and that I will hate the job. I'm honestly trying to ask if anyone on here agrees with them or thinks they are wrong. This is considered a state government job so it has a pension instead of a 401k. Would I make just as much in the long run as a truck driver? Any insights would be greatly appreciated. They truly are an amazing breed. I totally understand what you mean by how they just feel rejected when you leave for a few days or weeks. They are such a sensitive breed and truly connect with you on a much deeper level then most other breeds. Confused what company to choose from help! I just figured if they would allow a dog as big as a great dane then they must have a very flexible pet policy. I know they have a rider policy but I don't know too much about it. Look up Allie Knight on YouTube, she drives for Jim Palmer Trucking and has a lot of really great things to say about the company. Go back about 6 months or so in her videos to find where she started with the company. For a brand-new person fresh from CDL school. 40 to .45 a mile is pretty good. I have been really doing my homework on this company and I have yet to come across anything negative about them. There was another post I started on here about Jim Palmer Trucking, just search the company name in the search bar here and find my post. There has been a guy posting on there that has just started their orientation and will keep providing his feedback as he goes through training. So far he has said the company seems really good, going as far as to make him a welcome sign on the main entrance of the corporate building. Flatie, look up Jim Palmer Trucking. They have the same training program as Prime and they also haul their freight. They start you off at .40 a mile after training and will pay up to .45 with incentives. I've been talking to their recruiters and they seem very nice and honest. All in all I truly think they are an amazing company. But like I said look into them and see what you think. They have a very friendly pet policy. Just to tell you how friendly their pet policy is they would allow me to bring a fully grown great dane. I am also a Class B driver as well and would also love to hear any inputs on whether we would have an advantage and find it easier to upgrade to a Class A or does having a B not make a difference when upgrading to an A? Anyone have any advice on how to keep a bowl of water available for your dog's while driving? I'm trying to find how to do this without sloshing water all over the truck while your driving? Short of just only being able to give them water when you are stopping for a break I'd like to see if there was a way to keep a source of water available for them when driving since they are large dogs and drink lots of water. Besides Schneider which other companies truly let you pick your own loads? I like how Schneider has it set up giving you the freedom to choose your load, where you want to go and when you want to take time off. Any other companies do that? Anyone aware if Jim Palmer Trucking happens to do that? I've been looking into Jim Palmer Trucking and they look like a really good company so far and the pay seems higher than all the others. Look them up. I'm looking into going to Jim Palmer Trucking and was wondering if they let you choose your truck? They offer either Peterbilt 579 or Freightliner Cascadia's. I'd prefer to get a Peterbilt since it built a little larger in the sleeper cabin and has a wider size bed. I'm a large guy so this would be a more comfortable truck for me. Do companies usually let you choose which one you want or is it usually this is what you get? Ernie, so are you saying in the Peterbilt the mattress is closer to a full size mattress than the twin XL in the Cascadia's? So if I do my testing for my CDL Class A in Montana and I'm a Washington State resident does that mean I go back to Washington and get my license or do I have to transfer it to Montana? How exactly do they get your license through your own state of residency when you are testing out of your state? I remember will trans being a part of Jim Palmer but I don't remember hearing that O &S was also a part of them as well? I agree with you that this company does really look like an amazing company and yes I was drooling over the brand new equipment. Personally I'm hoping to get the Peterbilt 579 since from what I can see it looks like the sleeper cabin on it is a bit larger and the mattress looks bigger. Anyone out there that knows if this is true or not please let me know? I'm a big and tall guy at 6'4 so larger sleeper cabin is very important to me, as is also a thicker more sturdy mattress that would better hold mh weight since a good night's sleep makes me a safe driver. Did you ever get your great dane into a semi truck and if so how did you manage to get the dog up? I've heard about using a ramp, I'm just wondering how to get them over the passenger seat. Anyone know if it's usually ok to remove the passenger seat? My great dane is nearing the end of her life. She is old, almost 10 years old and I know she would be happier having me there with her than me to just leave her home. She likely won't be here for much more than a year. 1 year of giving up some space is a price I can pay.